This refreshing resort is everything you need on a holiday. 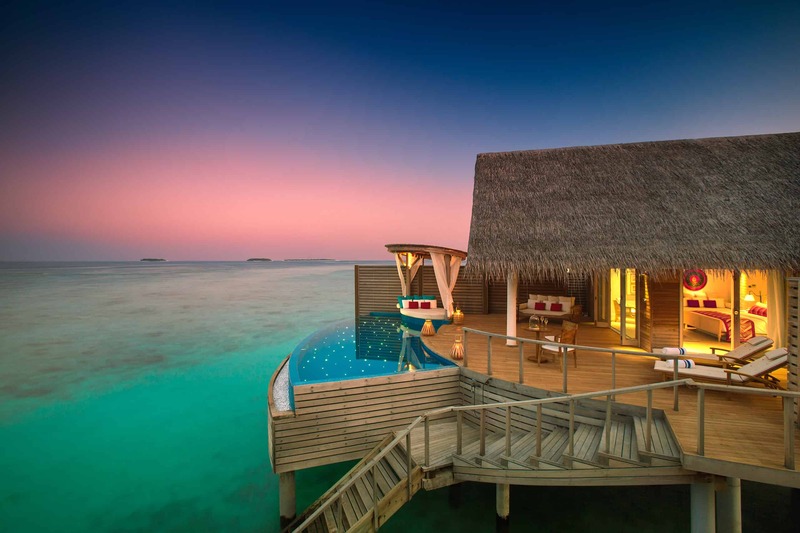 Spend your days lounging in your very own water villa with direct access to the sea, take a trip to the spa for a little pampering, or simply watch the sun set into the ocean with a cocktail in your hand. The food options available are sure to impress with each restaurant offering a unique dining experience. For the adventure seekers out there, why not try some of the water sports activities run by the hotel, including scuba diving, snorkelling and stand up paddleboarding. Your stay here it sure to be special, enjoy the beautifully decorated bedroom furnished to a high standard. The en-suite bedroom has a bathtub and rain shower for you to enjoy. The best part has to be the private pool which leads on from the terrace area. Take a quick dip to cool off from the hot Maldivian sunshine! From the deck there are some steps which give you direct access to the lagoon and beyond. Set on the white sandy beach and surrounded by lush tropical vegetation, these villas will give you a truly unique experience. The room is equipped with a beautiful king size bed, en-suite bathroom which is finished to a very high standard. The interior is designed with a local touch and modern themes, making your stay very comfortable. Enjoy the spacious wooden decking which has ample seating area. The terrace then leads onto a large private pool where you will be blessed with stunning beach and ocean views. The sea is only a short hop skip and jump away, so if you fancy a bit of snorkelling, you can roll out of bed and be there in no time! Shaped like a dhoni which is a traditional Maldivian boat. Enjoy the wide range of locally inspired dishes, whilst sitting on the deck and watch the sun set into the ocean. Here you will find delicious meat, seafood and fish dishes. Enjoy an evening meal here with a personal touch as the chef will personally ask you what you would like and prepare it for you. Make the mornings better with a delicious breakfast menu. Dine here for lunch and dinner if you are seeking a casual affair. You can choose from the a la carte menu. The perfect place if you want to catch the sun setting into the sea before heading out for an evening meal. Treat yourself to a cocktail or two! The unique treatments offered at the spa are perfect if you are seeking a traditional Maldivian relaxation experience. The use of natural herbs and remedies is very important at the spa, as they are believed to have healing powers. You can also join the daily yoga and meditation sessions which aim to help you focus your energy on your mind body and soul.